It was an action packed evening as NXT‘s last Thursday night edition aired on the WWE Network with the promised return of its newly crowned champion. Explosive battles were contested with the rematch for the NXT Tag Titles and singles competition between Hideo Itami and Curtis Axel. What other surprises were in store? Join me and find out as I dive into this weeks episode that show cases WWE‘s future superstars! The night began with the return of NXT Champion, Sami Zayn! We hadn’t seen him since NXT Takeover: R Evolution, where he won the title from Adrian Neville and where his long time friend, Kevin Owens, viciously attacked him. The crowd erupted in a chorus of Ole’s and the champion was moved to celebrate his victory among his adoring fans. Once back in the ring, Sami thanked the NXT Universe for their support and stated that the championship was as much ours as it was his (YAY!! I’M NXT CHAMPION!! mark that off my bucket list,) and that together we were all like a band, Sami Zayn and the Zayniacs (and now I’m in a band. Hot dayum!) He then addressed the attack that took place while he was celebrating his victory, stating that a man he trusted, Kevin Owens, killed the moment of the night. However, before much more could be said on the subject, former NXT champion and long time friend, Adrian Neville, interrupted and came down to the ring. He congratulated Zayn stating, that on that night, when he looked at Sami, he saw a champion staring back at him. Of course, being the good guy that he is, Sami reminded the man that gravity forgot that he was due a rematch. Cue William Regal’s music. 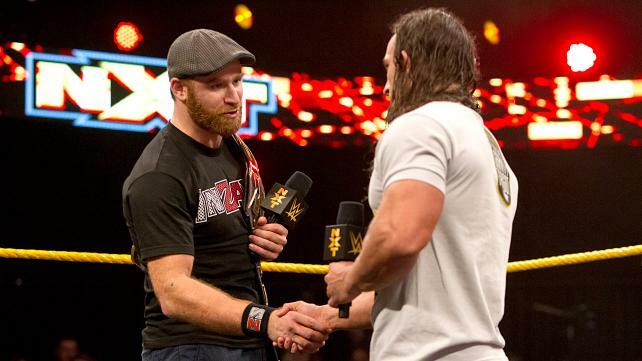 Our NXT General manager agreed that Neville was due a rematch and would receive one next week! Curtis Axel has been looking to reboot his career in NXT. 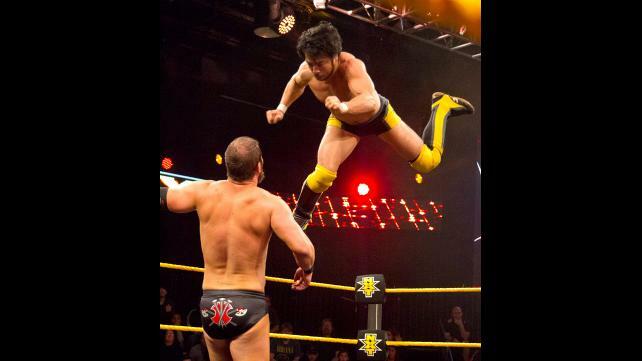 He got his chance in a showing against international superstar, Hideo Itami. Things looked to be going Axel’s way in the early goings as he used his size and strength to his advantage against the smaller Itami. However, my favorite angry Japanese man was able to land some lightning fast offensive kicks and a flying clothesline that created the separation he needed to gain the upper hand in the match. Curtis attempted to battle back but to no avail and was put down for the count when Hideo landed the knock out kick to the head. This match wasn’t as exciting as I had hoped it would be. I am putting the blame on Curtis Axel though. Hideo was fun as ever to watch and the crowd was firmly behind him. Axel on the other hand was generic and boring. Sure he was aggressive but there was nothing that made him stand out as a superstar. 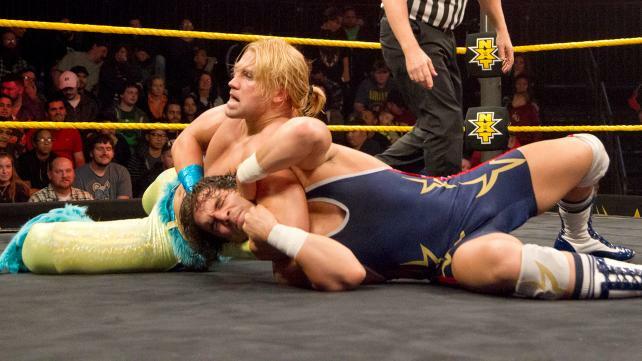 He was the same dull no pizzazz in ring worker in the NXT ring as he was on main roster programming. If he wants to revamp his career, how about revamping his style? His character is dull, his in ring work is generic and unexciting. The fairy princess of NXT started out strong against The Boss catching her with hard hits from the moment the bell rang. Alexa was looking for retribution on Banks for breaking her nose, but little miss sparkle sparkle came up short. She looked amazing in the beginning of the match, aggressive and had her opponent reeling, and Bliss looked to put Sasha away quickly after hitting a sunset flip powerbomb. But that was the only offense she would be able to muster as the baddest diva in NXT took control of the sparkley fairy girl and picked up the win with Bank Statement submission in the middle of the ring. As quick as this match was, it was entertaining. The aggression in the NXT women’s matches is unparalleled. They give their male counterparts a run for their money on many occasions. This match, was a perfect example of this. Sasha Banks is easily one of the most enthralling women to watch in the ring. Her hard hitting style is second to none and this clean win (even though Becky Lynch was ringside and could have interfered on Banks’ behalf) keeps her in the hunt for the NXT Women’s Title. Alexa, as stated above, looked great too. I would definitely like to see her more in the ring and pick up some wins to be in the hunt for the title as well. But she seems to have a ways to go before she can even be considered a contender. It’s always exciting when new talent makes their debut, but unfortunately for Chad Gable, his first match was against Prince Pretty himself, Tyler Breeze. At first it seemed as if the Gorgeous one would be overwhelmed by the mat prowess of the former Olympic wrestler as Gable kept Breeze on the defensive. However, Tyler’s experience and ability in the NXT ring coupled with being rested from a vacation and his innate aggressiveness, he was able to swing things back in his favor. It almost appeared as if Breeze’s rally would be snuffed as he suffered a devastating armbar in the ropes but quick thinking on his part allowed him to hit the Beauty shot to pick up the win over the eager rookie, Chad Gable. I enjoyed the debut of Chad Gable. He showed promise with his in ring technical ability but as of right now, it lacked the flash that will make him a star. He’s got a solid foundation to build on though, and I look forward to seeing what becomes of him in developmental. But my real excitement comes from the return of Tyler Breeze. Haven’t seen that much gorgeous in the ring since Sami Zayn pinned him on his road to redemption. I have no doubt in my mind that Breeze will be back in the hunt for the NXT title in no time. 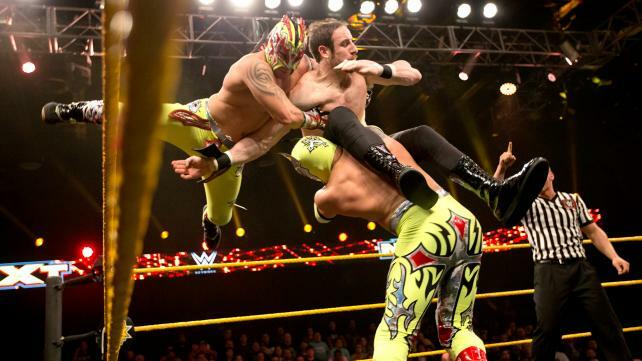 In an attempt to right the wrongs of their title match at Takeover: R Evolution, The Vaudevillians once again, faced the Lucha Dragons in a Tag Team Title match. The champions took control for the beginning of the match, using their speed and aerial tactics to keep Simon Gotch and Aiden English reeling. The heroic challengers were not to be underestimated as they wrested offensive momentum from the champions by grounding Kalisto and cutting the ring in half. The champions were in danger of losing their titles but somehow, the smaller luchadore was able to create the separation he needed to tag in Sin Cara. This was the jolt that the high fliers needed as they fought their way back to take control from the manliest tag team on the roster. No idea what to call the finisher that was used on Aiden but it was a work of art and was the downfall of the Vaudevillians title aspirations. I can’t tell you how many times I yelled at my TV during this match. Those trixie Lucha Dragons refused to stay down even with the extra umph that Aiden and Simon were put into their moves. I do have to say that this match made me respect the high fliers more. That double team finisher from the champions was amazing. And they showed why they are the champions. The Vaudevillians threw everything they had at Kalisto and Sin Cara, and still they were unable to walk away with the titles. My old school chivalrous duo may need to go back to the drawing board to figure out how to beat the one team that seems to have their number. This entry was posted on Friday, January 9th, 2015 at 5:09 pm	and is filed under Events, News, Television. You can follow any responses to this entry through the RSS 2.0 feed. You can skip to the end and leave a response. Pinging is currently not allowed. « ‘Zombies VS Robots’ Moving From Comic Book To Feature For Sony!! !